In the early nineties, our favourite things were snap bracelets (looks like a ruler but tap it on your wrist and it becomes a bracelet... SO cool), banana clips, Kylie Minogue and and stickers. If we had to pick though, stickers would win. Each of us had a photo album which we obsessively filled with stickers. One page was My Little Pony stickers, one page was glitter stickers, one page was scratch'n'sniff stickers (truly revolting but ridiculously amazing at the time), one page was glow in the dark Halloween stickers etc etc. Hours and hours were spent collecting and swapping and sorting these stickers and showing off your latest sticker finds in the playground was a favourite way to while away break time. Fast forward twenty years and our sticker books are probably folornly lingering in a dusty corner of the loft at our Dad's house but we haven't quite lost a love of collecting and cataloguing. Which perhaps explains our latest addiction, Pinterest. Designed "to connect everyone in the world through the 'things' they find interesting", Pinterest allows you to post photos of things on virtual pinboards. Now when you're doing a bit of lunchtime shopping from your desk and you spy a pair of boots that you love on Net-A-Porter you can pin them to your 'wish list' pinboard. Or, while blog browsing, if you see a girl whose style you love on The Sartorialist you can pin it to your 'style inspiration' pinboard. Planning a wedding? 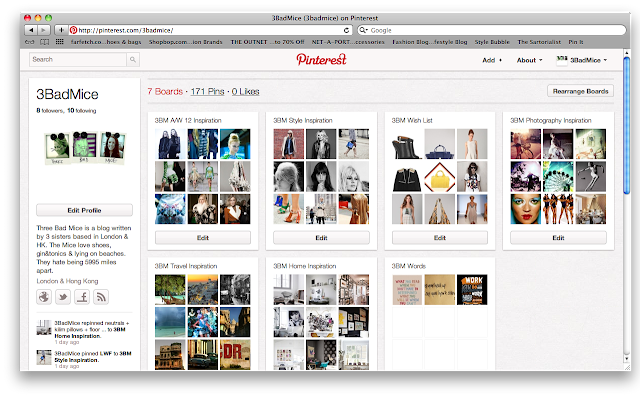 Pinterest is a perfect place to keep all your online clippings. Cue boards on dresses, shoes, flowers, invitations, place settings, chair covers (my God planning a wedding really does sound a little like a slow death by papercuts...). Geeky? Extremely. Something that girls do and boys will never understand? Without a doubt. But oddly therapeutic and addictive? You bet. Hours and hours have happily been whiled away collecting and repinning and sorting. You have been warned. Check-out our Pinterest at: http://pinterest.com/3badmice/. How do you join and get pinning? Well currently its invite only. You can request an invite from Pinterest but I've heard that this can take a few days. Alternatively, existing Pinterest members can invite you so if you want to get involved we're happy to invite you just drop as an email: 3badmice@gmail.com and you'll be pinning in no time.